Today I want to talk about epoxomycin, a molecule that has been associated with the name of Professor Crews (Yale). The company that emerged from this technology, Onyx, was recently bought by Amgen for 10+ billion dollars. Kyprolis is the name of their drug, which is a close cousin of epoxomycin. The difference between the two is just a couple of modifications to improve solubility and other drug-like properties. 10 billion is a lot of value for a fairly simple epoxy peptide, which means that there’s more that meets the eye. 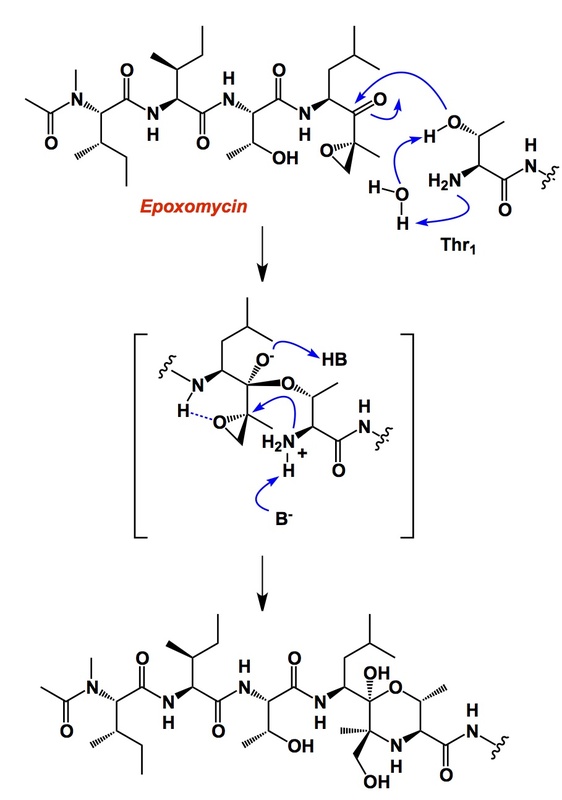 Indeed, epoxomycin (an irreversible inhibitor of proteasome 20S) displays a marvelous mechanism of action. The molecular gymnastics that take place during its interaction with the terminal threonine of proteasome 20S are shown below. Obviously, this is not your typical epoxide that reacts by a classic Sn2 mechanism with some active site nucleophile. If you look closely, the interaction has two distinct steps: hydroxyl of Thr1 attacking the carbonyl group followed by amine reacting with the epoxide ring. Thus, the specificity is defined by a multi-center engagement, something that I think is worth emulating in other contexts. Below is a link to the Crews’ seminal paper. This discussion made me think of a parallel with a dangerous way we might reach conclusions in science. I suppose this is a reminder to all students. After all, they are the gatekeepers to the most precious part of the research enterprise: collection and analysis of the primary data. I recall Olah and his memorable injunction some 20 years ago when he said “you can never prove a mechanism of a reaction, you can only disprove it”. This is a profound statement (it is also fundamentally correct as it reflects the fact that our techniques constantly evolve and we will only see and appreciate more details, not less) because it highlights that scientists are naturally good at disproving things. We really are. To take this mantra one step further, I submit that our preferred way of doing science should consist of rigorously disproving our gut reactions and conclusions. Why? It’s because we are good at proving things wrong and also because we will not fall into the dangerous trap of having the conclusion ready before the available evidence supports it. Prior to 1967, people in the Haight-Ashbury neighborhood of San Francisco thought that they had seen it all. Little did they know that a social earthquake was about to befall them, which later became known as the Summer of Love. The music of Jefferson Airplane was in the air and I just wish I was around then, but I was not even conceived at that time. There is another memorable event that hails from that eventful year. Across the Pacific Ocean in Japan, the late Professor Oyo Mitsunobu (1934-2003) developed one of the most remarkable and useful reactions in the history of organic chemistry, the Mitsunobu process. There are a myriad of reasons to love this reaction, which epitomizes the so-called oxidation-reduction condensations. 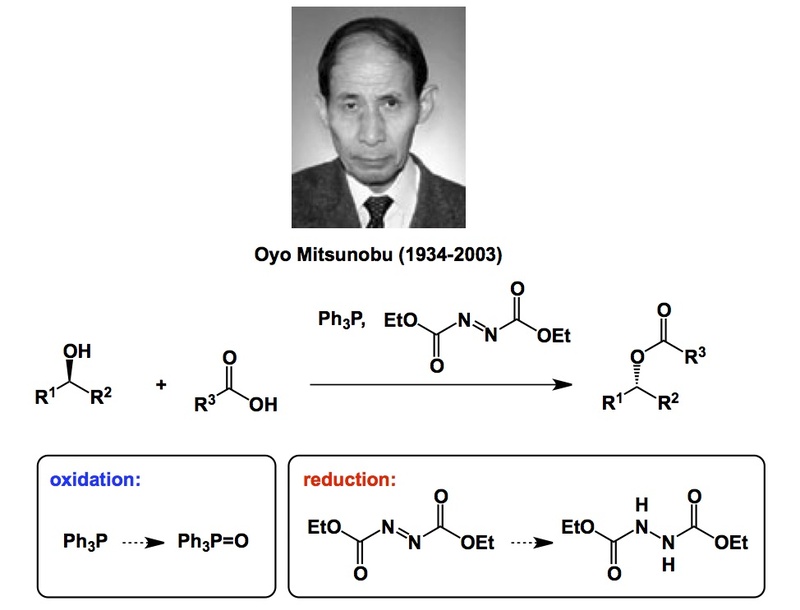 In the Mitsunobu reaction, the cost of installing a new bond comes from a combination of oxidation (phosphine into phosphine oxide) and reduction (DEAD into the corresponding hydrazine) processes. There are people who would say that this is not atom-economical, blah blah. No, it ain’t. But go tell this to Ed Grabowski, the retired process chemistry guru from Merck. He will tell you a thing or two about the immense utility of this “ungreen” reaction. I wish we had more ungreen processes like that, I tell you this much! Any chemistry that you use without worrying about referring to the original journal reference is in the lore of chemical synthesis. The Mitsunobu reaction is certainly there. It is important to keep trying to find ways of guiding our students through rough times in research. As advisors, we have been there before and it is useful to ensure that our students know that things are cyclical by nature and good times tend to follow the bad ones if you give it 100% of your effort. Some people go to prominent figures from the past for motivational language. But there are too many cliché quotes out there and I am not particularly fond of them because they state the obvious and sound dogmatic. For instance, we know that Churchill said: “Success consists of going from failure to failure without loss of enthusiasm.” It is true, but this statement tends to rub some people the wrong way. Those who decide on a career in science do it for reasons other than money. Their commitment to pursue knowledge creation is admirable. Yet, once in a while when we ruminate, there is a tendency to forget that we have voluntarily chosen this difficult, yet intellectually rewarding, path… Indeed, this is the business we’ve chosen. We have been having some exciting results in heterocyclic fragment screening using X-ray crystallography. The initial hits made with the help of Aman and Elena now enable further design and we will hopefully nail some of our targets together with Shinya, Conor, Jeff, and Rebecca in my lab. By “targets” I mean a series of methyllysine-binding proteins for which we intend to identify specific and cell-permeable probes. It will take us a while (longer than the remaining 2 months of my sabbatical), but we are in this thing for the long haul. I want to cover one particular line of reasoning that has been brewing in my head for a while now. The sheer number of new (from my lab’s perspective) tools that have emerged out of the SGC collaboration, is quite staggering. They range from sophisticated soaking methods to co-crystallization and docking studies. I have turned into a total fan of Schrodinger Glide software (www.schrodinger.com). Dr. Conor Scully, a research associate in my lab, introduced me to this tool and I have continued learning on my own. I am having a lot of fun, although I sometimes feel bad about peppering the great Schrodinger team of developers with all sorts of questions. It is a full assault, I must admit, but these guys are real pros. Earlier today, Hege Beard, my contact there, informed me that she has developed an algorithm that will help us with covalent docking of aziridines to cysteine-containing protein targets. We have had some glitches with this, but the method is working really well now. So where is my point for today, you might ask? Here it is. As I immerse into the elements of design and docking of ligands for our targets, I am forced to revise some of the dogmatic thinking I have been using in the past. For instance, one of the points I used to love chuckling about had to do with some curious publications that described the design of a molecule and experimental validation of its activity in biochemical and cellular assays. This would eventually lead to an atomic level view of the pivotal interaction, manifested in a co-crystal structure. And there came the moment of truth when scientists would humbly admit that their molecule, while active, potent, etc, engaged its target in a totally different way from their initial prediction. To back up my words with a concrete example, here is something form SGC. 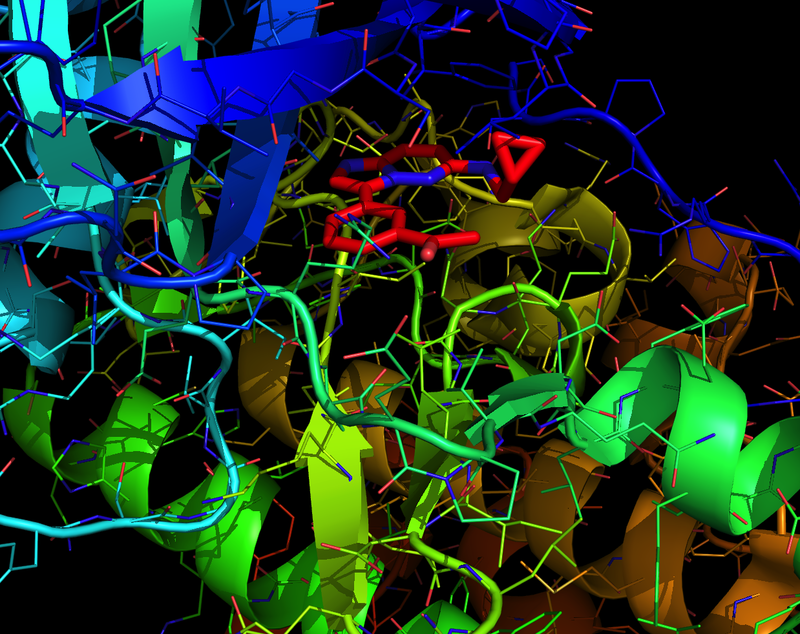 In this nice work, a kinase inhibitor (in red below) of Pim1 kinase was developed. I made this picture using PyMol. The co-crystal structure shows that the molecule does NOT bind in the anticipated “Type 1” mode (it is when the so-called hinge region is engaged in protein/ligand contacts). Having said that… I was recently on a lecture tour in B.C. and talked to a biochemist who told me about the so-called two-stage binding in cytochromes. This is totally unrelated and I am not an expert in this at all, but it makes me wonder about my previous position I just described. Here is my proposal: when you see a binding mode that is not consistent with the projected (designed) one, it may be a simple manifestation of kinetic/thermodynamic control and the fact that there are different phases to an interaction. 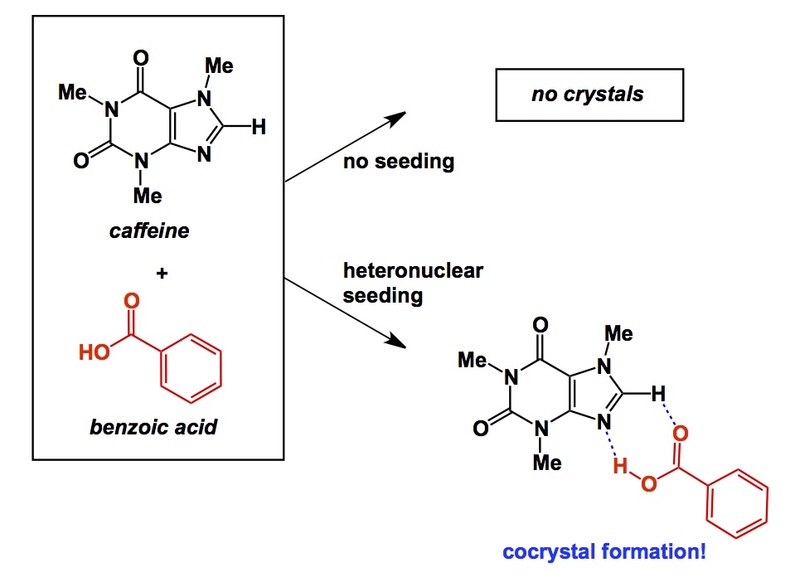 In other words, what eventually crystallizes corresponds to the most stable arrangement that, by its nature, does not invalidate the design that took a different part of the binding site into account! Of late, I have been having a number of discussions about pi-systems with my students. There are many reasons for this surge of interest, too many to mention in one post. This discussion of pushing the boundaries of unusual pi-reactivity reminded me of some really innovative work coming out of Prof. Neil Garg’s lab at UCLA. 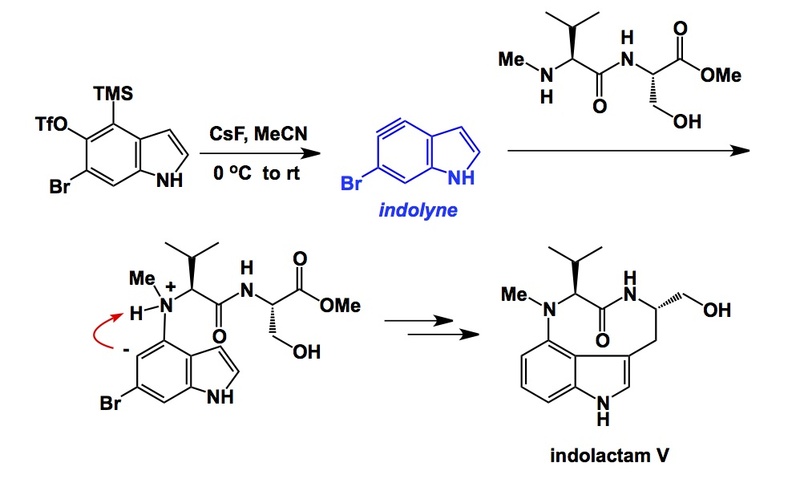 Neil has pioneered some cool ways of making (and using) indolynes, the distant cousins of benzynes. One of his earlier papers related to this technology appeared back in 2010. I really appreciate this work, which is due to my lab’s long-standing interest in medium sized rings, particularly that of indolactam V, a well-known PKC inhibitor. In Neil’s indolactam synthesis, indolyne intermediates are put to clever use. What you see below is the key step that enables this synthesis. The chemistry involves regioselective addition of an amine nucleophile to the strained indolyne pi-system.